A lot of us may assume that there is only one type of refrigerator in which you have to figure out where to put everything, but that’s really not the case. There are a variety of refrigeration systems and also freezing systems that each work best with a specific set of food and materials. However, there are some basics that are pretty much the same across the board, in terms of what to put, where. Start with the door, the first thing you notice when you open your refrigerator or freezer. You need to keep in mind that the door will be the most exposed to outside air aka heat. With that in mind, you will want to put things there that do not require cold air all the time. This could include condiments or drinks or really anything you don’t mind having super cold. The upper shelves of a refrigerator are much different from the door. They have the most consistent temperature of anywhere in the fridge, so it is best that you keep the dairy products or other products that require constant refrigeration up there. Basically, if you are worried something will go bad, put it in the top of the fridge. This could include leftovers that you are worried about rotting. Ken Immer, chief culinary officer at Culinary Health Solutions, echoes that sentiment by saying: “Use the fact that it won’t stay in the fridge as an opportunity to throw something away before it rots.” Hey, we are all about keeping things fresh as long as possible! Not only will you save food if you maximize your refrigeration tactics, you will save money. While some people think you should put your eggs in the bottom of the fridge, that is actually not the case. You should put them more near the top, because of the air circulation in the refrigerator. Then, there is the case of the meat drawer. 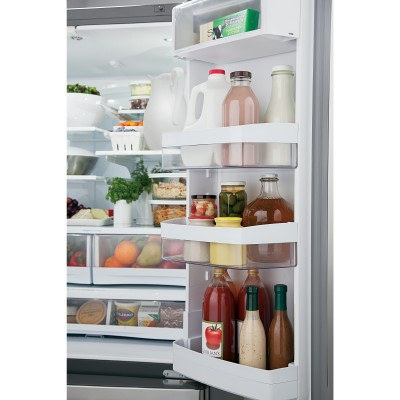 If your refrigerator has an angled cabinet shelf, that is the best place to put your meal to ensure maximum freshness. Also, you will want to use what is referred to as the crisper to maximize the freshness of your vegetables or in some cases, fruits. Basically, any produce you will want to keep in the crisper. However, there is another tip to maximizing the freshness of your veggies and fruits. This involves having two crispers, as when too many vegetables and fruits are close together they will start to over-ripen. You can mitigate this by separating them into two different crispers, based on which ones are ethylene producing and which are not. If you are interested in maximizing the freshness of the items you store in your refrigerator, you should also maximize your equipment. Excellence Industries has the best commercial refrigerators and commercial refrigeration systems on the market. They will ensure your food stays fresh, longer!